Try out my online shop, browse the end of season sale from your sofa. Happy shopping folks. I will be back with some creativity soon. So if you are stuck at home on Monday because of the snow this is the place to go. Today was the star book class in the studio. What a marathon it was. Unfortunately I had under estimated how long it would take to put together. Everyone had all their pieces ready so here is a bit of help for them to put it together. Page 1 everyone completed. Page 2 is the second half of the stairs and the rats. The stairs go onto the left hand side of the page, stick some of the rats to the back of the stairs so that it looks as if they are coming down the stairs., three on one page, three on the other half. Page 3 is the parlour where the sugar plum fairy is dancing. The two chairs need adding to the left hand side on dimensionals/foam pads. Adding the sugar plum fairy. Use double sided to tape to put the thread on her back. 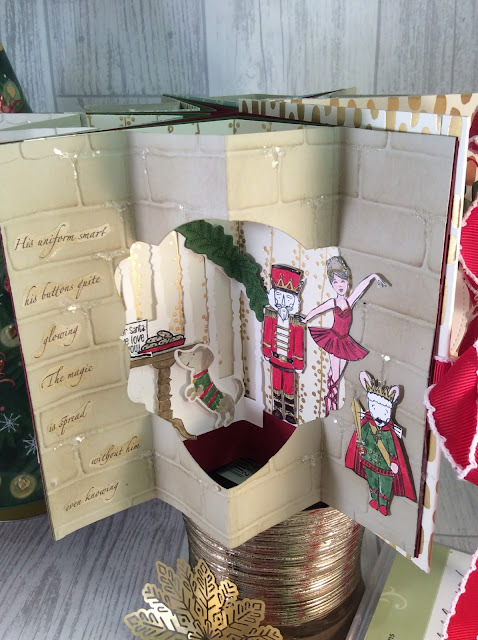 Tape each end of the thread to the M shaped card at the top and the bottom The M shaped card has folds going in the same direction as the wall page but sat 1cm further back The chairs and the picture on the wall are added with foam pads/dimesionals. The window is stuck flat on the opposite wall. I will post a picture of the M part on Monday when I am back in the studio. Don't forget to add your mouse! 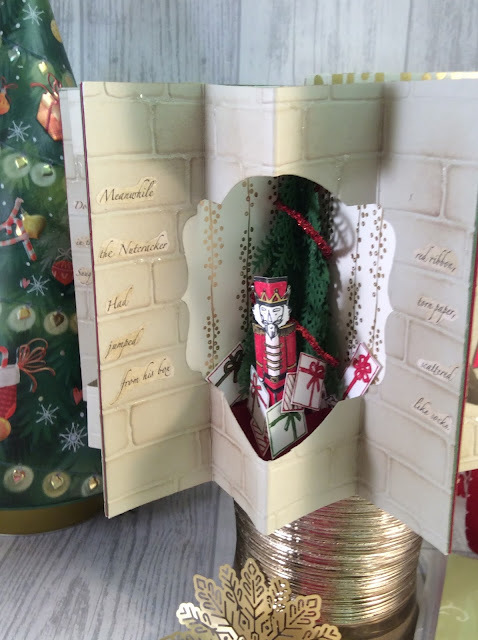 Page 4 is the Nutcracker jumping out of his box. 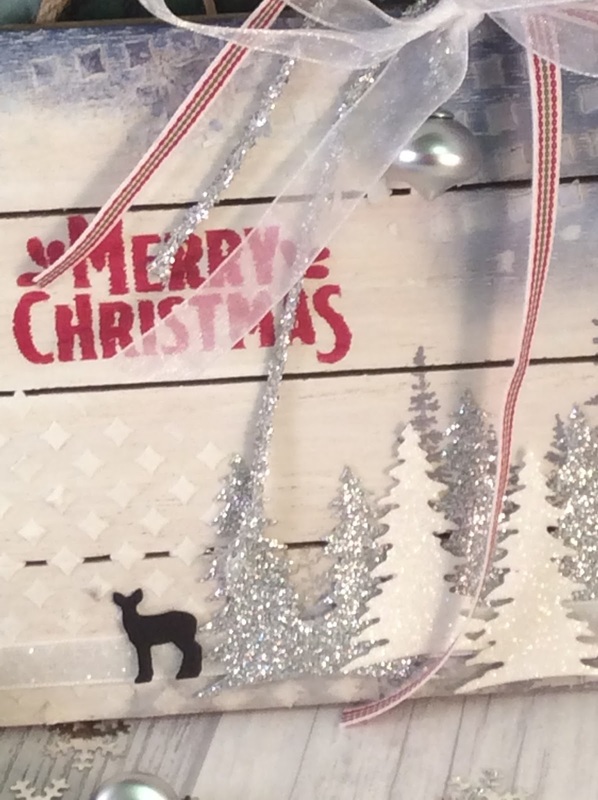 The Christmas Tree goes in the centre of the page. 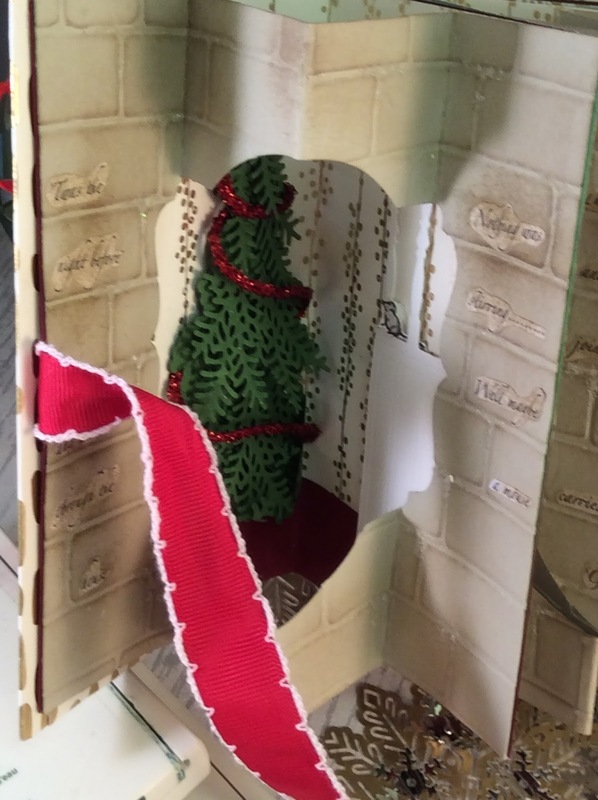 The presents overlap each other stuck to the red skirting board and the back of the wall to give it a three dimensional view. The nutcracker is stuck to the the back of the presents. 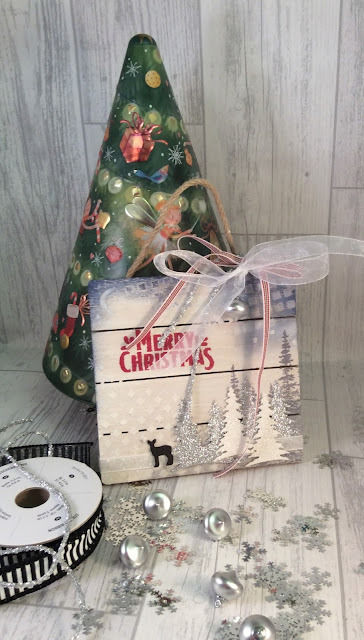 Keep folding the page shut to make sure it will work as you add each present. The nutcracker actually folds in half. Page 5 is the easiest. First to add, is the the staircase. 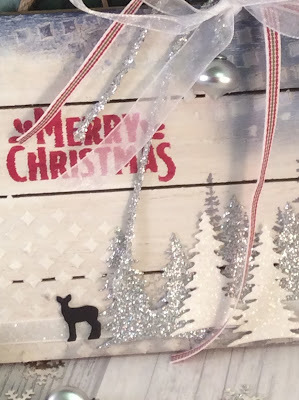 Place this so that it just wraps past the fold in the page and 1 cm down from the top of the red skirting board. The stairs are flat to the page with the garland along the bannister rail. In front of the stairs to the left add the table, plate of biscuits and the dog, the table and the dog sit along the bottom edge of the stairs. These are on dimensionals/foam pads. Your last nutcracker stands at the bottom of the stairs, the sugarplum fairy balances on the edge of the 'wall'. The rat is on the right side, on the wall with dimensionals. Don't forget your mouse, can you see mine. The cover. 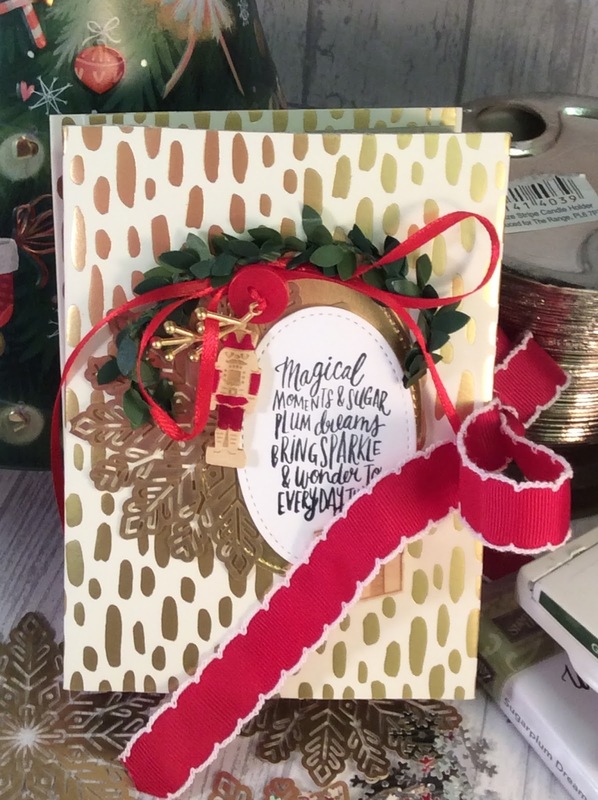 Use the designer paper to cover the thick card back and fronts. You only need to fold in about one to one and a half inches of paperalong each edge. The rest is spare. Once this is stuck, lay the front face down, put a line of double sided tape across the middle and place the ribbon on the sticky. (fold the ribbon in half and put the fold to where the spine will be then open up the ribbon to one long line) This ensures it doesn't slip. Glue page one on top, follow with the other pages, when you have glued page 5 put a line of double sided tape across the middle and lay the ribbon across this. Ensure the ribbon wraps around the spine fairly tightly. Then glue the back on. To decorate the cover layer up the gold foil oval, the snowflake and the white oval with the sentiment. Thread the thin red ribbon through the embellishment tie a knot thread this through the button and tie a large floppy bow. Stick the button with glue dots. 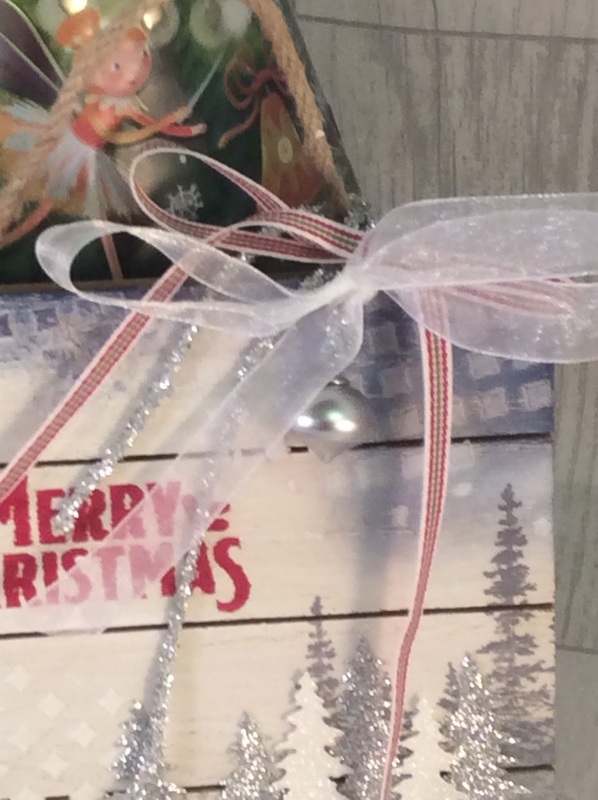 the little wooden nutcracker is stuck on with glue dots as is the parcel below the sentiment oval. The last little mouse is sitting on the parcel. The green is draped across the top with a couple of glue dots. All items used are in the seasonal catalogue except the Designer paper which is in the annual catalogue. I have an order going in on Monday if you would like anything without paying for postage. I'm back from Birmingham.... and its another busy week in the studio. This morning we made a 6" square box during card and a cuppa. This afternoon in the Tuesday afternoon class I repeated last Wednesdays class with the decorated mini easels. On Thursday its Stamp A Sack. Whats that I hear you ask or shouldn't that be stamp a stack, well yes! 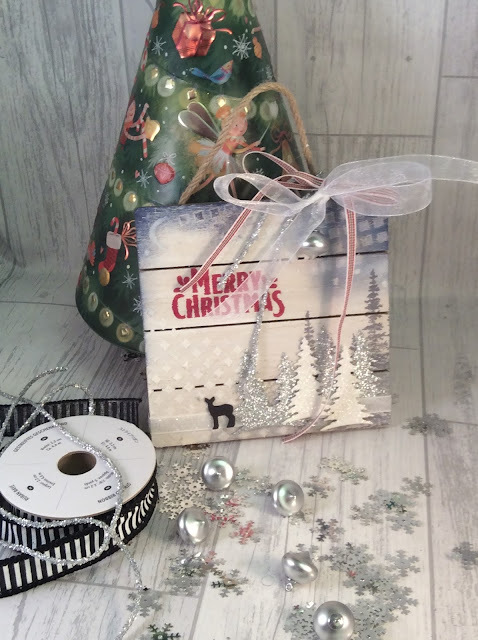 I had miss heard or mis spelt originally when I became a demonstrator with Stampin'Up so Stamp a Sack has stuck and on the day everyone gets a paper 'sack' to put their cards in as they complete them. 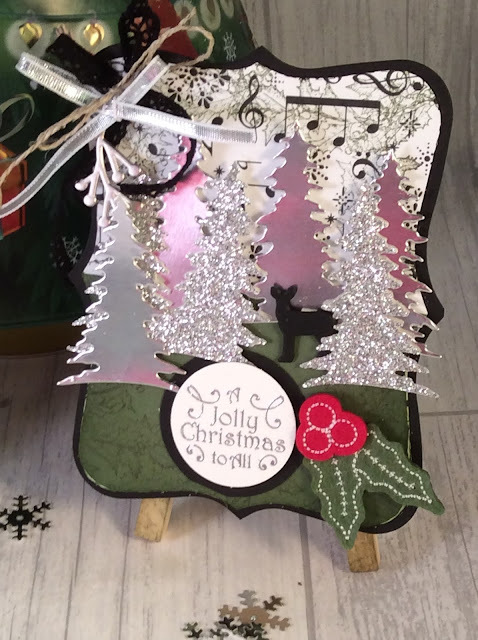 This year we are making 24 cards, 4 each of 6 designs, so nothing complicated but it is very bling. We are using the year of cheer paper. Today I bring you a picture of all 6 designs then as the week goes on I will bring you more detail about them. I love these, they look so classy, three gold and 3 silver. Yesterday it was 'On Stage'. That is another name for a Stampin'Up conference. 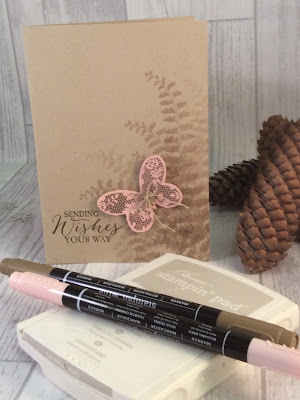 Its a brilliant day where lots of stampin'up demonstrators get together. We chat, we talk business, we craft and we get to see the next set of new products. Its now an ideal time to join my team of demonstrators, get into the swing of what it is all about then come with me in April to the next On Stage event. 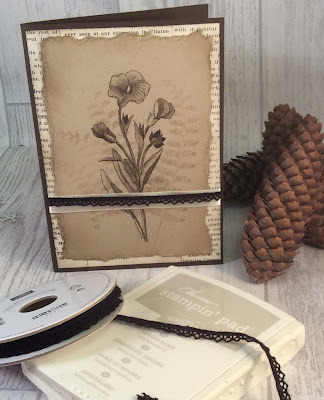 At On Stage we take swaps, this is a Stampin'Up tradition. I have made 50 of my swaps, it won't be enough for everyone but it does mean I will come home with 50 beautiful makes form 50 other demonstrators. I always find these inspiring. I have used the 'In this world' stamp set in Dapper Denim on Dapper Denim card. Both sentiments and the image are stamps in this set. The happiness is die cut with the stitch framlits. They are now permanently out on my big shot. In side each bag is a Twilight chocolate. I'll be back on Tuesday with my very glam christmas cards we are making for the Stamp a Sack this Thursday and next Thursday. Finale every who is starring! The last page has everyone including the dashund, table and biscuits for santa and a dissappearing mouse who has appeared on every page....had you spotted him? He also has a starring role on the front cover. Here he is on page 4. Love the poem for this page but couldn't carry it through onto the page, but he does look like he has just popped up out of a box. ...............and that tree again. I think if that had been the only 6 dies in the pack I would have bought it but there are 20! Yes 20 dies including the staircase, the parcels the 6 parts of the tree and lots of others. For all those who spend online between £25 and £149 I will send you a FREE class pass for January. If you are not local I will send you a pack of 4 cards and instructions. Its time for the sugar plum fairy to arrive. Another room, another wallpaper, the same DSP pack. I so enjoyed creating the background for this page, A little water-colouring and some fussy cutting. Those chairs from the 'In this world' stamp set are just right. For all those who spend online between £25 and £149 I will send you a FREE class pass for January. Page two is about the fight that takes place in the story between the rats dressed as soldiers, there are other protagonists but its the rat that there is a stamp for. I have coloured them in red and green but half have a red uniform and green cape the others are green uniform and red cape. I havealso used the 'misti' to get the stamp reversed image so they have the sword in the other hand! neat. 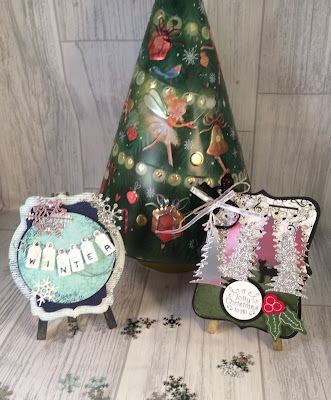 If you shop for this lovely little set in my online shop use the hostess code, spend £25 - £149 and get a free class pass for January. If you click on the stamp number it will take you into my shop on the page for that stamp set. The second Wednesday of the month is a class with some very long term friends. We talk, laugh and cry together. We also craft together. This month rather than cards the ladies asked if they could do a mini easel in the style of one that has been on my shelf of favourite bits for quite a long time. I had a lot of fun making these, seasonal but not too christmassy! There is daubing, layering, stamping, punching, bow tying and die cutting on. 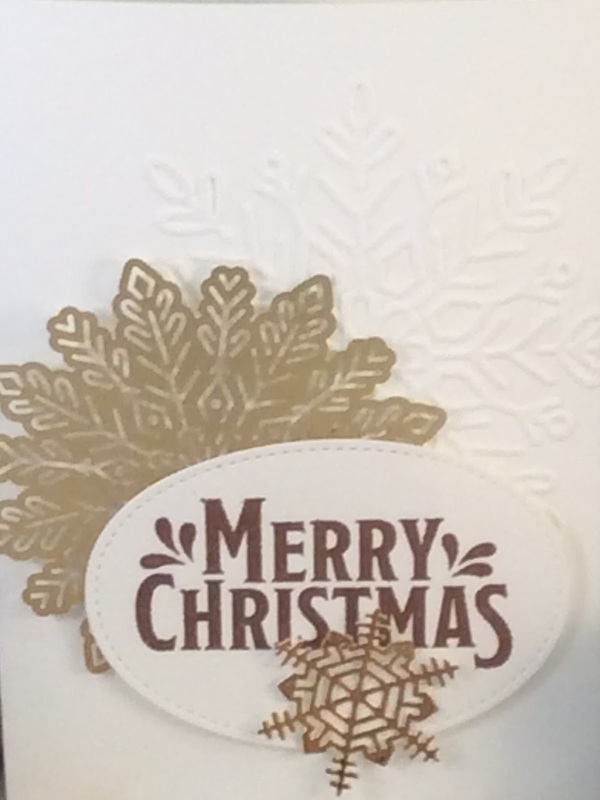 A little heat embossing on the christmas one. So lots of techniques gathered into one little project. Today I bring you the first page of the star book. Each book has five pages, a bit like creating 5 cards. 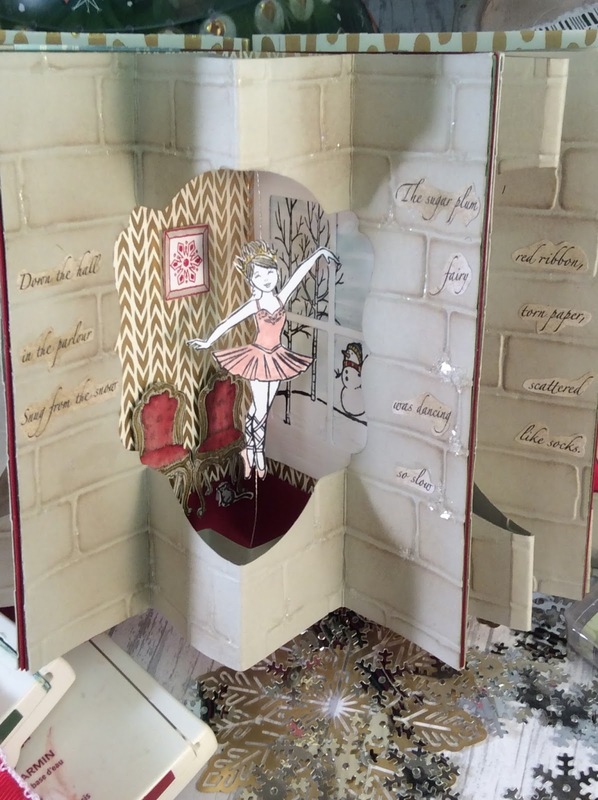 My star books don't usually tell a story but when I saw the 'sugarplum wishes 'stamp set I knew I had to do something linked to the Nutcracker. The little wooden soldiers in the embellishmennts pack just added to the idea. They I bought the designer paper for a baby card and discovered how beautiful the foiled side was, it looked like the sort of wall paper you might have in a posh house and I was off. One night when I couldn't sleep I managed to write a little poem for each prise. It wouldn't win any prises but it worksed for me. As you open each page, you are seeing into a room in the house for the party. This is the hall way with the christmas tree, A brilliant die set, as are the stairs. I wonder how many Stampin'Up demonstrators who read this know which stamp set the little mouse comes from??? 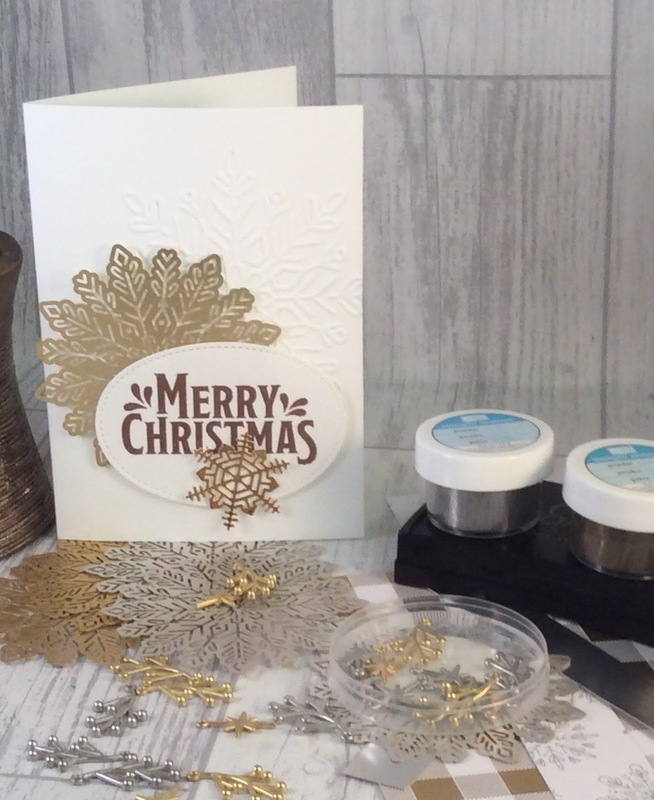 The wall embossing folder is amust for anyones collection of crafty goodies. I have daubed then added icicle stuff(!) to the joins of the bricks to bring some sparkle, some bits sparkle more than others and it is difficult to show on the camera. 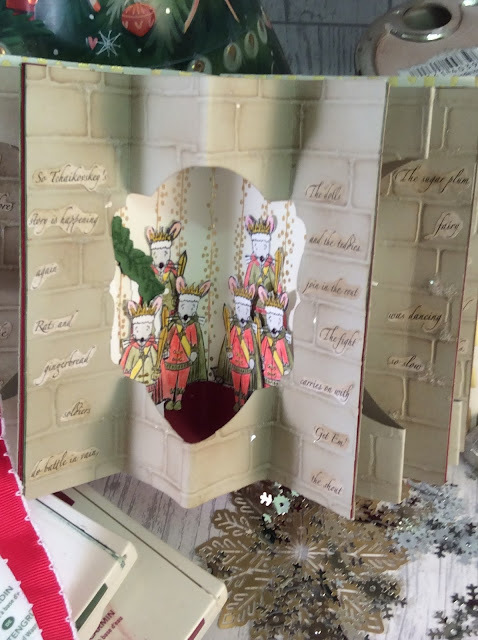 The star book workshop is on Saturday November 25th in the studio. Its all day from 10.30 - 3.00 all materials are supplied. £25.00 Book online here more exciting pages to come. November is the busiest month of my year. For the next 5 weeks I have either a class or a craft fair every Friday and/or Saturday. So I have been busy in the studio getting a bit ahead of myself. The blog will post every day for the rest of the month I have so much to show you. Firstly and most important this years star book is finished. Big smile and happy dance here. I have been thinking about it since the seasonal catalogue arrived in my hands in August! Today I just have the cover to show you, there are a few refinements I still want to make but it is complete. The theme is the Nutcracker story. I am thinking of changing the sentiment from being stamped in black to stamping in versamark and heat emboss with gold embossing powder. Will have to try it and see what that looks like. Pop back tomorrow to see the first page. For my weekly card and a cuppa I have been working my way along my stamp shelf. This week butterfly basics came out. I have used this many times with a variety of colourways but at this time of year I didn't want pink or yellow. I decided I would go neutral. I have used crumb cake and early expresso ink. The first card is almost a single layer card. Just the butterfly stamped on a bit of extra then fussy cut. The butterfly has a soft gold button with a bit of bakers twine. 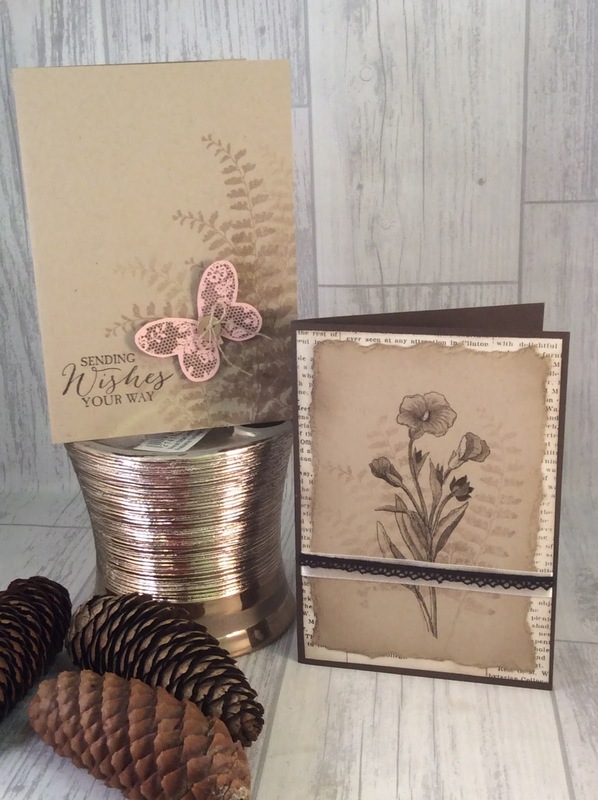 This would work with a range of coloured card for the butterfly....use your favourite. The second card I really enjoyed making. I stamped the flower onto crumb cake with early expresso then I have used an aqua painter to develop the colour on the flower and leaves. The fern is stamped with crumb cake but stamped off first. Because it looked aged I decided to follow this theme through by tearing the edges, there is a knack to this which is my taught technique for the session. 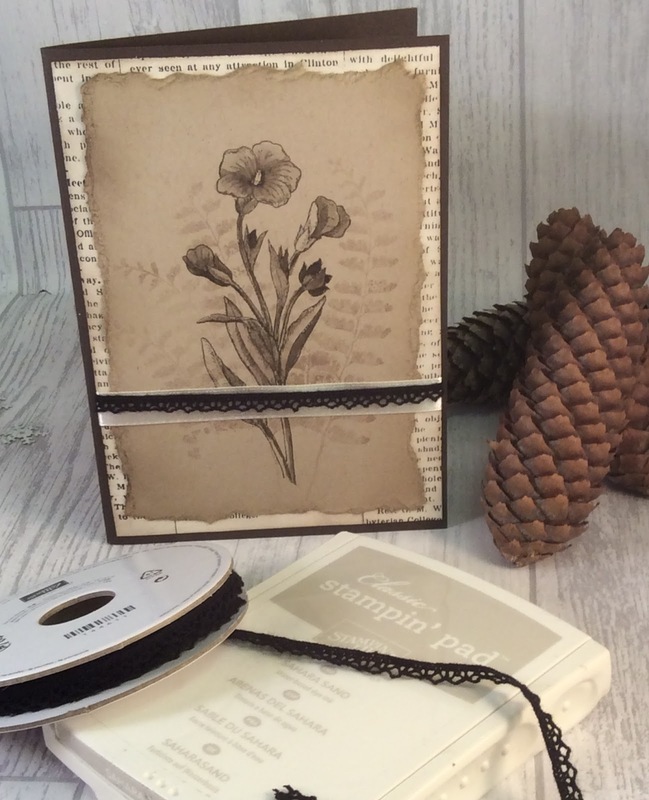 I have used some very vanilla ribbon layered up with some of the black lace trim from the current seasonal catalogue. I looked a bit stark just on the early expresson base card so I have added a piece of newsprint from my stash. I wonder what we will be doing next Tuesday. Add this number to any order you place then in December I will have a small crafty gift for you as a thank you.